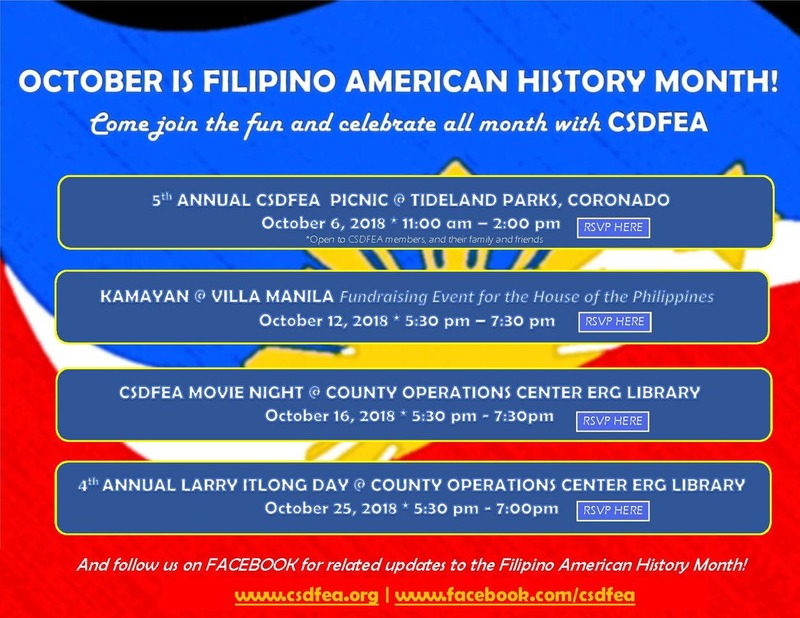 The Filipino American National Historical Society (FANHS) has been observing October as Filipino American History Month since 1991 to commemorate the first documented landing of Filipinos in the United States over 425 years ago. In November 2009, Congress passed the resolution officially recognizing October as Filipino American History Month. 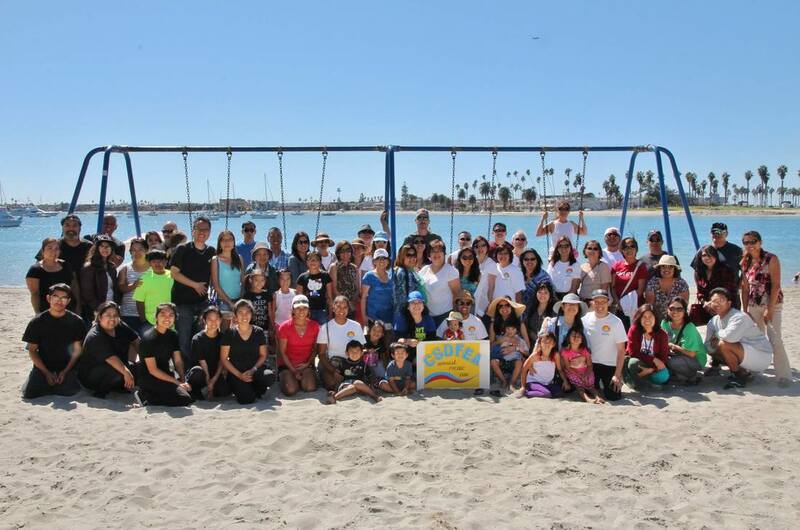 Filipino American History Month is widely celebrated with many Filipino American organizations hosting independent commemorative celebrations. CSDFEA is celebrating by bringing its members together in fun, meaningful ways all month long! Event #3 - Movie Night "Filipino Americans: Discovering Their Past for the Future"
The Filipino American National Historical Society (FANHS) has been observing October as Filipino American History Month since 1991 to commemorate the first documented landing of Filipinos in the United States over 425 years ago. In November 2009, Congress passed the resolution officially recognizing October as Filipino American History Month. Filipino American History Month is widely celebrated with many Filipino American organizations hosting independent commemorative celebrations. CSDFEA is celebrating Filipino American History Month 2017 by bringing its members together in fun, meaningful ways all month long! 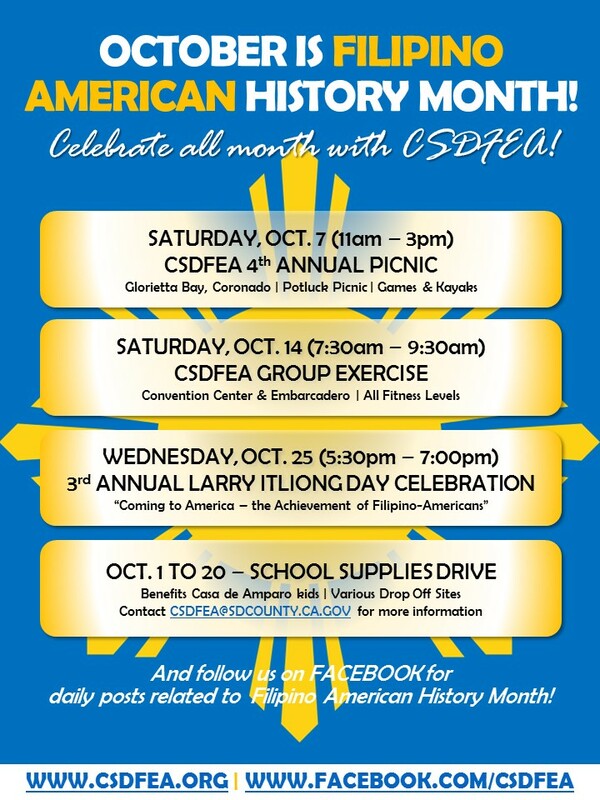 CSDFEA will kick-off Filipino American History Month with a Potluck Picnic at Glorietta Bay, Coronado. Get to know CSDFEA members and their families, enjoy delicious Filipino dishes, and relish in the beauty of Glorietta Bay! We’ll also have games, entertainment, and even have a couple of kayaks ready for those who want to venture into the water. This event is open to CSDFEA members and their family &friends only. Health of its members is important to CSDFEA and one of our priorities is to continue to provide members the opportunity to participate in group fitness activities. The CSDFEA Members’ Group Workout @ Convention Center is an early morning walk and workout at the Convention Center and Embarcadero. Along the way, we will make multiple stops for various body weight exercises such as push-ups, squats, pull-ups, static hangs, wall walks, planks, box jumps/step-ups and abs exercises. Beginners are welcome and exercises will be tailored/modified for each person's ability. This event is open to CSDFEA members and their family &friends only. In the summer of 2015, California Gov. 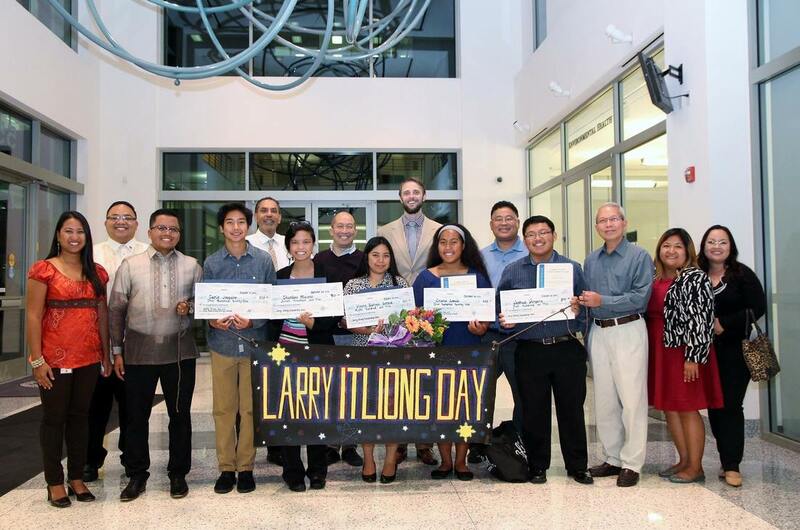 Jerry Brown signed the bill that established Larry Itliong's birthday, Oct. 25, as Larry Itliong Day. Itliong was a Filipino American labor organizer who has been described as "one of the fathers of the West Coast labor movement." This year, CSDFEA's theme is "Coming to America - the Achievement of Filipino Americans". Join us for some light appetizers, and a great opportunity to learn about the Filipino American perspective. CSDFEA will be collecting from its members, donation toward a school supplies drive to benefit local non-profit, Casa de Amparo. Our goal is to collect enough supplies for 20 students residing at Casa de Amparo. 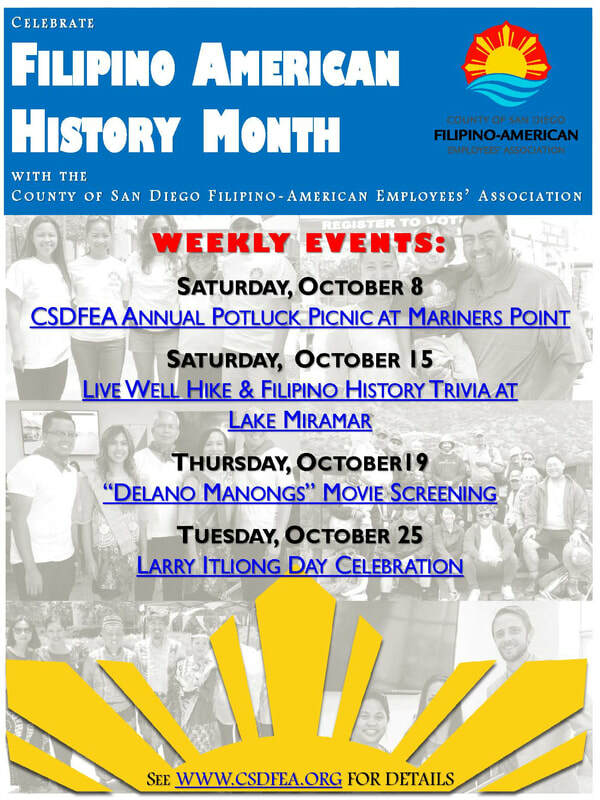 CSDFEA is celebrating Filipino American History Month 2016 by bringing its members together in fun, meaningful ways all month long.